Updated: 8:30 p.m. | Posted: 3 p.m.
Gov. 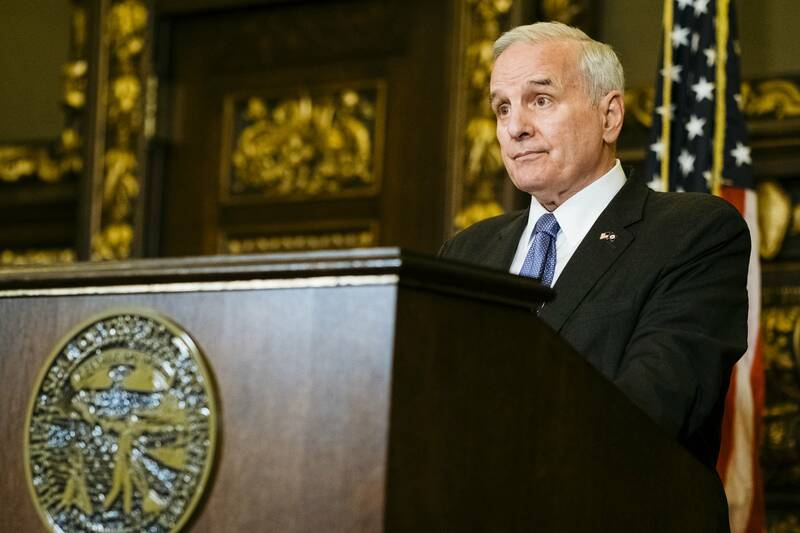 Mark Dayton on Monday joined a group of governors who are committing their states to upholding the Paris climate deal's emissions cuts despite President Trump's decision last week to withdraw the U.S. from the pact. Organized as the U.S. Climate Alliance, member states aim to reduce emissions by at least 26 percent from 2005 levels and meet the federal Clean Power Plan targets. "President Trump's withdrawal will cause serious damage to our environment and our economy," Dayton said in a statement. "Nevertheless, Minnesota and other states will show the world what we can achieve by working together to conserve energy, to use cleaner and renewable energy, and to leave a livable planet to our children and grandchildren." California, New York and Washington started the alliance. Minnesota, Puerto Rico and eight other states signed on Monday. Minnesota already has relatively aggressive plans for fighting climate change. Some coal plants have shut down as renewable energy has made gains. In fact, the state is already on its way to accomplishing the Paris deal's goals, Roopali Phadke, a Macalester College environmental policy professor, told MPR News host Tom Crann. The Climate Alliance, while only a few days old, is more than just a way for mostly Democratic-run states to thumb their nose at the president, Phadke said. "I think the significance of it is it demonstrates that the president's decision to pull out of Paris does not represent the goals of the United States, that it's out of steps with what Americans think, particularly Minnesotans," she said. "We are a globally minded people." States have often been testing labs for climate change policies, Phadke said, so the alliance could prove that the Paris emissions reductions and other goals are feasible. Plus, the states already on board represent big chunks of the nation's population, GDP and emissions. State Rep. Pat Garofalo, R-Farmington, said both President Trump's decision to pull out of the Paris climate deal and Gov. Dayton's move to join the U.S. Climate Alliance represent "marketing and style over policy and substance." Garofalo, who chairs the House Job Growth and Energy Affordability Policy and Finance Committee, said he supports the scientific consensus that human activity is driving climate change, although he opposes the Clean Power Plan, that the Trump administration wants to scrap. Garofalo said political leaders who care about cutting carbon emissions should stand behind policies to extend the lives of Minnesota's two nuclear power plants. "The greatest threat to increased greenhouse gases in Minnesota right now is the early closure of our nuclear power fleet. We get more emissions-free energy from nuclear power than we do all renewables combined," Garofalo said. Xcel Energy's Monticello and Prairie Island Nuclear Power Stations have been in operation since the early 1970s. The 1,100 megawatt Prairie Island plant, near Red Wing, produces enough electricity to power about a million homes. Last year Xcel officials said they'd consider studying whether to close Prairie Island before its reactors' operating licenses expire in 2033 and 2034. Aside from the United States, the only nations that didn't joint the Paris climate deal were Syria and Nicaragua, whose leaders said the pact wouldn't do enough. MPR News Reporter Matt Sepic contributed to this story.